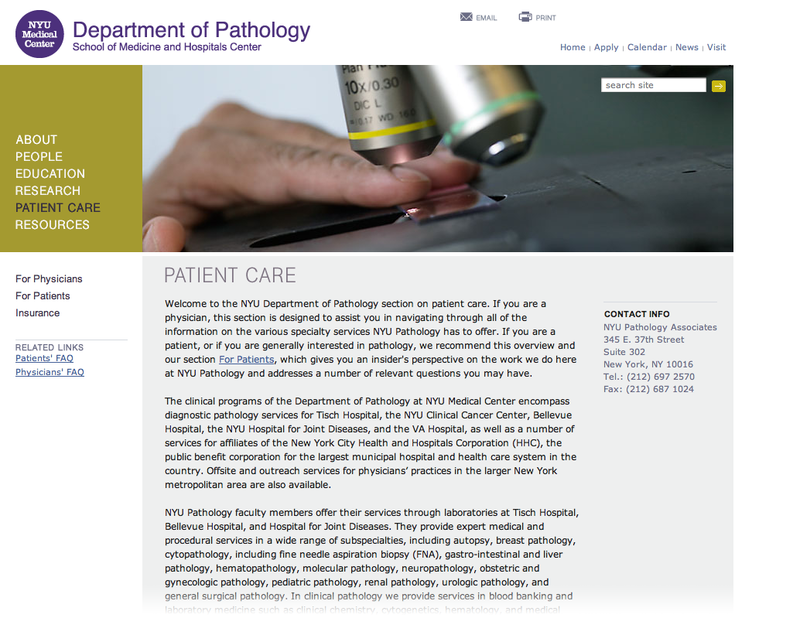 DPCI implemented the Drupal Web content management system for NYU Medical Center's Department of Pathology. The Drupal platform enables the department to publish educational, research and patient care information more efficiently and effectively. The New York University (NYU) Department of Pathology is one of the largest departments at NYU Medical Center, with physicians practicing at Tisch Hospital, Bellevue Medical Center, the Hospital for Joint Diseases and the VA Medical Center. The department, devoted to establishing a scholarly community for the creation and dissemination of knowledge related to pathology, is widely regarded as a leader in immunological research, molecular oncology, and experimental pathology. 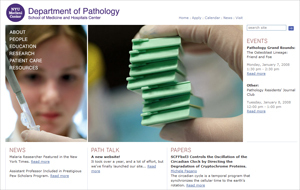 To support its goal of providing and promoting the latest education, research, and patient care information, the Department of Pathology, led by Chairman David B. Roth, M.D., Ph.D., needed to upgrade its Website. It worked with DPCI and its design partner to redesign the Website and implement new technologies to simplify the publishing process. 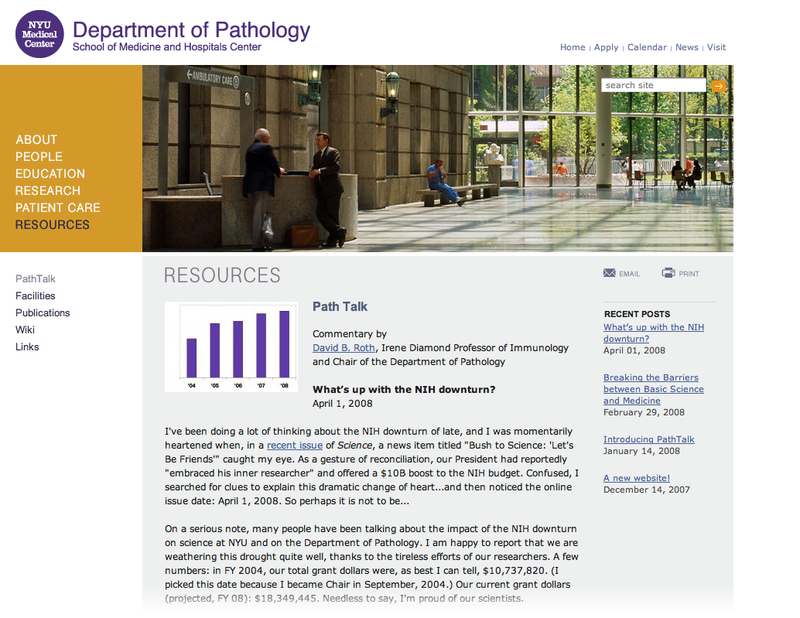 As leading universities and medical programs increasingly publish research and promote programs on the Internet, the Department of Pathology realized the need to rethink its current Website strategy in order to maintain its prominence in the field. It required the ability to keep different constituencies - clinicians, researchers, outside physicians, patients and students - informed on various pathology-related topics. The Department of Pathology's existing Website (and the process to publish new information on it) was information-poor and required technical knowledge to maintain it. This made it costly and cumbersome to keep the Website timely. 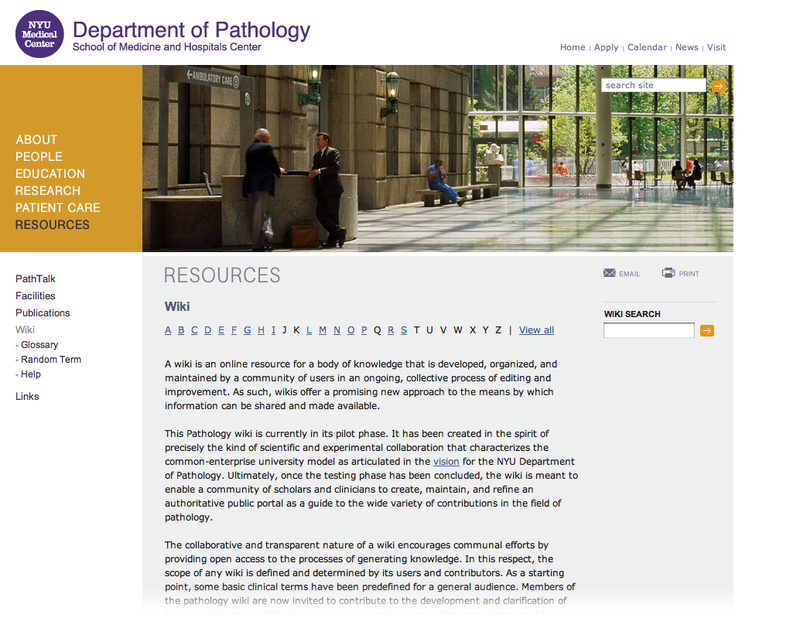 The Department of Pathology envisioned a new Website that would both provide a broad range of dynamic content and serve as a resource to engage each visitor type. 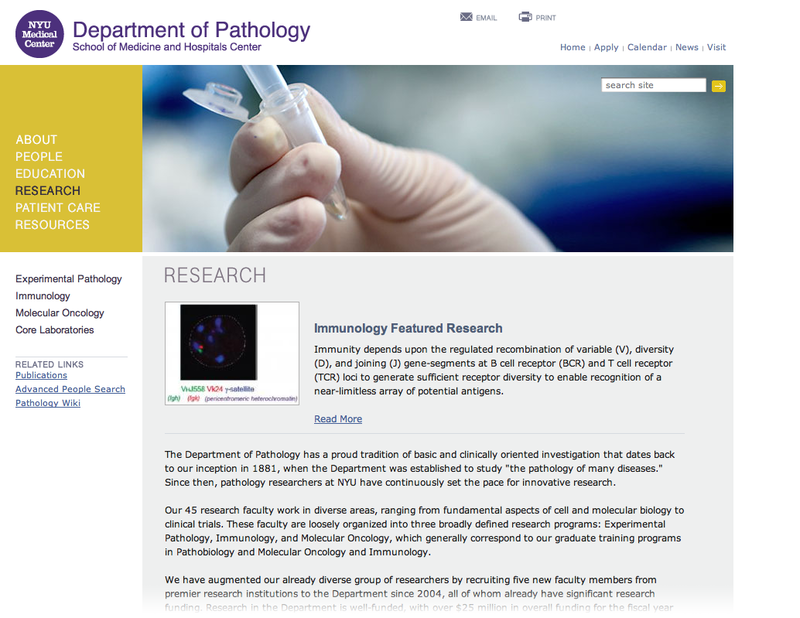 It first worked with the designer on concept, content strategy, and design, then enlisted DPCI to create solution requirements then provide technical consulting services to support the Department of Pathology's growing Web publishing needs. "We want to attract the best and the brightest to our growing programs by highlighting the strengths of our diverse department - today, the most cost-effective way to reach outstanding students and researchers is through a strong Web presence." Dr. Roth said. 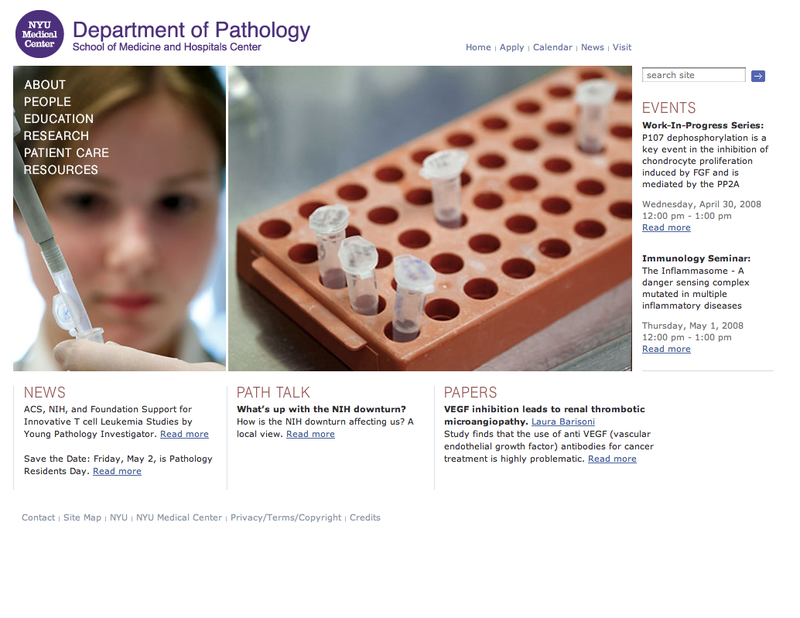 Based on the Department of Pathology's needs, DPCI provided consulting services using Drupal Web content management system, an easy-to-use Web publishing solution. With Drupal, members of the department who do not have technical Web-editing expertise can have the ability to publish content and update their personal profile pages, meaning more than 160 faculty members have the potential to participate in maintaining the Website. DPCI also customized the Drupal Web content management system with an enhanced search capability. This allows visitors to find people, publications, and other material on the Website with ease. Additionally, DPCI implemented a "Wiki" collaboration tool that allows glossary content to be revised and edited by authorized faculty and staff. "After working with Dr. Roth and his team to define solution requirements, we were able to build the technology infrastructure that will enable the Department of Pathology to take their Website to the next level," added Tracy Gardner, Vice President Client Services at DPCI. "The Drupal-based solution provides a user-friendly environment for the different users and groups to update information, publish new works, and deliver more compelling content in a timely manner." 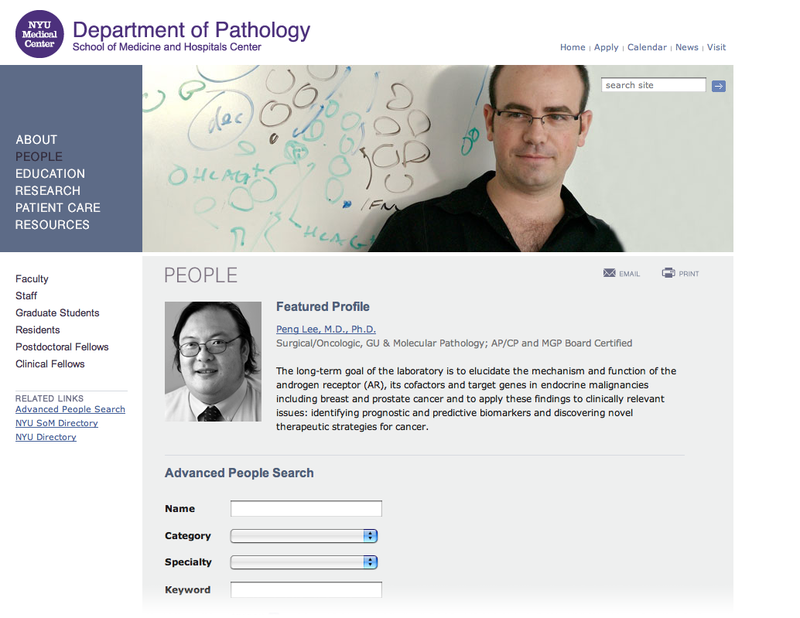 The Department of Pathology now has a dynamic Web publishing platform to showcase its research and scholarly works and deliver all types of patient information to its various audiences. Authorized staff members now have control of the Website's maintenance, including updating and editing content, without needing technical expertise in HTML. As a result, updates and new information are published more quickly, and more members of the department are engaged in producing content. Perhaps the greatest value of all is that the new Website can expand and grow as the program does. The Drupal-based solution gives the Department of Pathology the ability to promote its triple mission of education, research, and patient care, as well as the individual needs of the people who are instrumental in the evolution of the department and the field of pathology. "Working with DPCI has enabled us to utilize cutting edge technology without complexity and empowers the entire team at the Department of Pathology with new tools to deliver insightful research, patient information, and educational programs," Dr. Roth added. "The new site rocks."